What did kids do before video games? We had model trains. 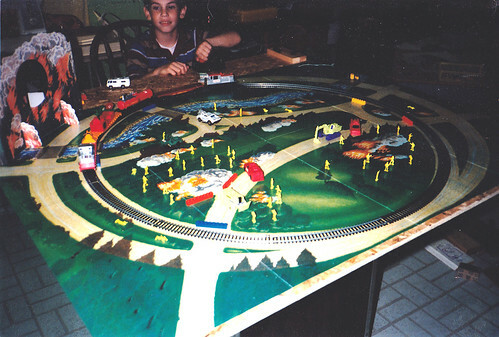 Long before the wonderful world of Nintendo took over my childhood, my favorite method of wasting time was playing with my model train set. I got my first train set for my 6th birthday. It was your basic all-in-one train set but I thought it was awesome. 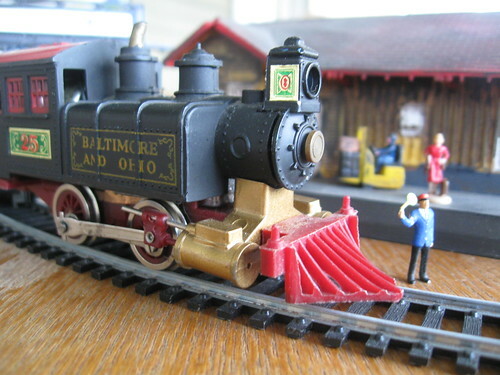 It was called the “Fire Fox” train set, which was a firefighter themed kit. It had a basic locomotive and all the freight cars you could want all the way down to the caboose. There wasn’t much track, barely enough to go in a circle, but it did have a train car that had a spring-loaded launcher that shot an airplane, not to mention it had a bunch of little plastic firefighter figures and a few fire trucks. It was really a complete play set that happened to have an electric train. It was a pretty good deal, both for me and my parents. However, my obsession with model trains just got worse from there. It might not look like much but it had everything I could have wanted. The set came with a fold-out mat with roads, houses and trees printed on it, and that sufficed for a while, but before too long the entire setup got an upgrade. Once my parents saw how much fun I had with my train, they got a sheet of plywood and that became my play space. The best part was it let me design and build my own custom landscape. My mother, the consummate crafter, helped me make my own mountains, hills and tunnels with paper mache and cardboard. Then with help from some cereal boxes, I made my own buildings and very quickly my own little city started to take shape. Toss in a few Hot Wheels and Transformers for good measure and I was all set. I remember getting books from the library on how to decorate and make my own little accessories, it was so much fun. But there’s one thing you can’t do on your own when you have a train set…make your own train. Slowly but surely I customized my train set..check out that tunnel! You’re at the mercy of the hobby stores when it comes to train engines and extra cars, and little did I realize at the time but they were expensive. Sure, the set I got had all the stuff you needed to get started, but from that point on I built my train set up piece by piece over several years, getting a few things for my birthday and Christmas. Friends and family knew I loved my train set, so that helped speed things up. Looking back at it now, I really didn’t have a lot of stuff but when you’re 7-years-old, it felt like I had everything. 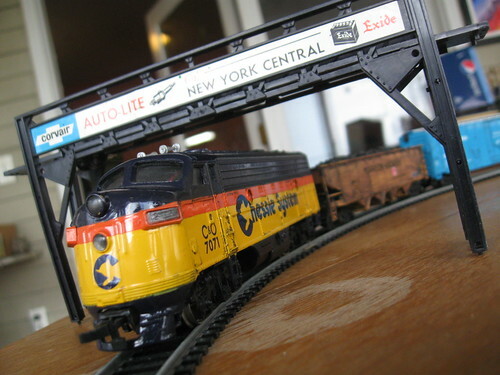 I had several locomotives, a lot of freight cars…I even had a trolley and a crane! Then somewhere along the way my play space grew as we added another sheet of plywood so I had a “huge” 8-foot area on which to make the perfect train layout. I might have had a decent collection of train cars but I had even more track. 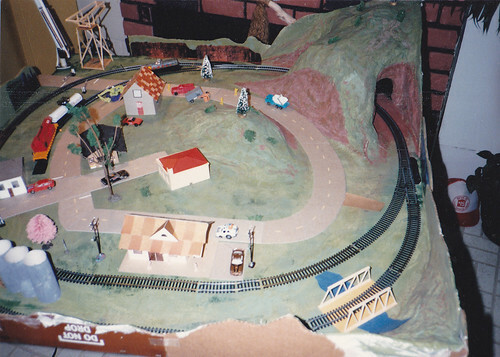 I used to spend hours just drawing and planning my track layout, and of course I always needed more. I think I had more fun planning and building than I did watching the train go around the track. I guess in the end, the train just went around in a circle, but you could create a story with the environment, and that’s just what I did. Every building had a story and every train had a purpose. 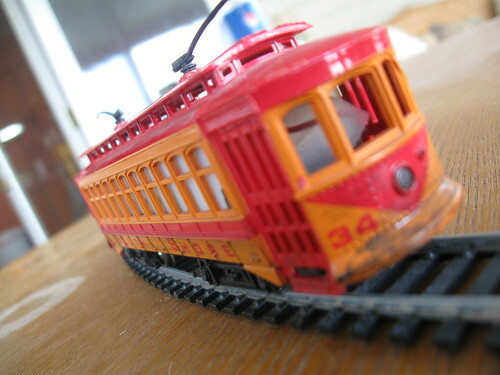 I even tried to combine my slot car set and my train set…but that didn’t turn out so well. A trolley...for those simple cross-town commutes. Life on the railroad was a lot of fun but it all derailed when I got my Nintendo. Instead of wanting train engines and fake trees for Christmas, I wanted NES games. My train set eventually got packed away and I haven’t really looked back until now while writing this article. To my surprise, most of my train set was still together and probably still works. I took some time to look up the state of model trains today and it doesn’t appear as though much has changed since I was playing with them 25 years ago. There are a few new pieces of technology around today, like cameras and more computerized controls, but all in all, it’s still just a model train set. However, one thing I understand now as an adult is just how expensive keeping a train set can be. Locomotives seem to range on the low end around $50 and up and beyond $100. That’s a lot for anything, if you ask me. Even the basic train cars run at least $20 and go up from there depending on how big and real you want things to be. Then you have all the extras like cars, people, trees, signs and telephone poles. It might seem cheap at first when a pack of something like telephone poles is only $3, but when you consider how many you need to make your set look “real”, it quickly adds up. Rather than have the dozens and dozens of the accessories I wanted, my town had to survive with only a few telephone poles and a mailbox. I have yet to find any inexpensive hobby, although my Hot Wheels addiction certainly comes close, but a train set doesn’t qualify either. I can see the appeal of keeping up with a model train hobby as there’s a part of me that wishes I had. There’s a lot of challenge and fun on many levels, from constructing environments to wiring switch tracks and painting freight cars. But model trains require a lot of time, dedication and money…and at least two out of three of those dwindle more and more as you get older and older. I’d love to see what I could do with a train set today, but I don’t think I could afford it…or more so, I wouldn’t want to. I think having a model train set is a lost art, a toy that is totally under appreciated in today’s world of techno-gadgets and video games. But I challenge any video game to amaze and mesmerize a child as much as a model train set. A train set is real, physical fun. It’s hard to beat a toy that you touch, build and are then able to watch all your hard work come to life.